The number one priority at the D.E.L.T.A. Rescue Super Sanctuary is to provide the best possible care and comfort for our animals. Our founder, Leo Grillo, has invented the perfect solution to providing our dogs relief from the heat of the summer, and the cold temperatures of the winter by designing a stuccoed straw-bale adobe doghouse. The stuccoed straw-bale doghouse provides our dogs with exactly the right comfort and cover from the elements. In an effort to help dogs all over the world Leo has created a video that provides step-by-step instructions from the materials needed to complete the project, and a how-to demonstration of building a stuccoed straw-bale doghouse from the ground up. D.E.L.T.A. Rescue receives no help from the government and relies solely on donor contributions. 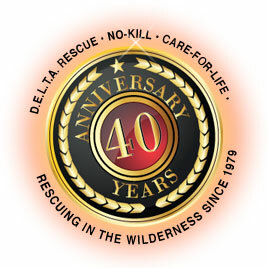 Please include DELTA Rescue Super Sanctuary in your monthly giving. What a cool way to house a dog or dogs… This is a great outfit!